The major challenge for both the space elevator and the aerovator concepts is that the incredibly strong yet lightweight tether material that they require does not yet exist. We have already seen that for his space elevator, Bradley Edwards needs cable material with a tensile strength of 130 gigapascals (1,300,000 kilograms per square centimeter, or 18,500,000 pounds per square inch). An aerovator could be built with a lower strength material, but it still requires a tensile strength on the order of 5 to 10 gigapascals (50,000 to 100,000 kilograms per square centimeter, or 710,000 to 1,400,000 pounds per square inch). 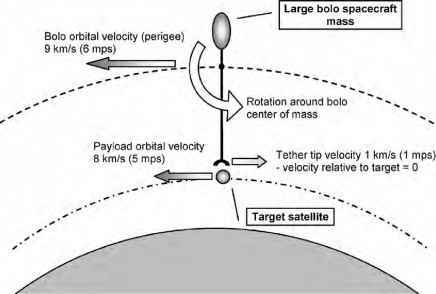 Tether Orbital Launch System (HASTOL) and the Lunavator. Its performance is also not that far off from what is required for an aerovator, but a space elevator needs a material whose tensile strength is more than 30 times greater. The nonexistence of this "unobtainium" is the main reason why many regard the space elevator as nothing more than an interesting thought experiment, a basis for entertaining science-fiction stories but not something that could become reality in the near future. In 1991, however, Sumio Iijima of the Meijo University in Japan discovered a completely new material with fantastic properties. He electrically charged superhot carbon soot and put it under a microscope to create and study so-called "buckyballs." These are closed, spherical molecules of carbon atoms linked together in a kind of soccer ball pattern. This atomic arrangement gives the buckyballs an amazing strength, comparable to that of diamond crystals (which consist of tetrahedral box patterns of carbon atoms). To his surprise, he also found various cylindrical, thin-walled structures of chained carbon atoms in the condensed soot he studied—molecules we now know as "carbon nanotubes." The tubes he saw were tiny, less than two nanometers wide (approximately 1/50,000th the width of a human hair), and of various lengths. The individual nanotubes turned out to be lightweight, as stiff as diamonds, and yet a hundred times stronger than steel at one-sixth the weight, and even ten times stronger than Kevlar. Moreover, in contrast to the round buckyballs, the long nanotubes can be woven together into super-strong yet flexible fibers of any required length—just what is needed for a space elevator! It seemed that the "continuous pseudo-one-dimensional diamond crystal" used in the fictional space elevator cable Arthur C. Clarke described in his 1979 novel The Fountains of Paradise had been found! Although Sumio Iijima's discovery made carbon nanotubes known all over the world and initiated extensive follow-up research, it turns out they had been mentioned in several earlier scientific studies. Their history goes all the way back to 1952, when Russian researchers Radushkevich and Lukyanovich published images of 50-nanometer-diameter carbon nanotubes in the Soviet Journal of Physical Chemistry. International Conference on the Space Elevator in September 2003, the University of Kentucky's Advanced Carbon Materials Center announced that it had managed to produce a nanotube-fiber tether just over 5 kilometers (3 miles) long. More recently, a research team at Rice University found a way to align carbon nanotubes in the same direction by combining them with sulfuric acid. This is an important achievement, because individual nanotubes handle pulling forces best if applied in the length direction. As a result, a ribbon in which all nanotubes are embedded lengthwise has the maximum achievable tensile strength; the less they are aligned, the less individual nanotubes help in forming a strong fiber and hence the lower the tension that the ribbon can handle. Researchers at the University of Cambridge in the United Kingdom are now able to create and spin nanotubes into fibers in a single process, enabling them to produce kilometers of fiber per day. Their method starts with a hydrocarbon base material, such as ethanol, hexane, methane, or diesel. Together with a small amount of iron-based catalyst, called ferrocene, this is injected into a 1300C (2400F) furnace. Due to the extreme heat, the hydrocarbon is broken down into hydrogen and carbon. Using particles of the iron catalyst as a scaffolding, the carbon atoms then merge into cylindrical structures, forming a dark mass of millions of individual nanotubes. To wind it up, a rod is inserted into the furnace to grab the material and pull it out, stretching the entangled mess into a fine thread of lengthwise-aligned nanotubes like wool on a spinning wheel. Further alignment of the nanotubes is encouraged by swathing them in a faint mist of acetone when they emerge from the furnace. The fiber is then spooled on a motorized wheel. Advances such as these are promising, but for sufficient strength a space elevator ribbon will need to incorporate many such individual threads. This can be done by embedding multiple threads in a matrix, typically a polymer plastic, to produce a composite material tether. The stresses in a space elevator ribbon will require it to consist of about 50 percent nanotube fiber, which is difficult to achieve; practical tether ribbons developed up to now include only a couple of percent of nanotubes. With more of them embedded, the bonding between the nanotubes and the matrix weakens, and the strength of the tether decreases. Improvements in nanotubematrix bonding are necessary to be able to increase the number of nanotubes that can be embedded. Research on carbon nanotubes and the manufacturing of fiber and multiple-fiber composites is ongoing in many laboratories—not primarily for use in a space elevator but mostly because of potential applications such as super-strong bulletproof vests, lighter yet tougher aircraft structures, bomb-proof refuse bins, and more robust jet engine fan blades. The various ongoing nanotube developments may make a space elevator ribbon with sufficient strength and low mass possible in the not-so-distant future. On the other hand, any structure as large as a space elevator is likely to have many tiny defects in the construction material, which will lower the overall tether strength compared to that of perfect individual carbon nanotubes. Calculations by Nicola Pugno of the Polytechnic of Turin in Italy, reported in 2006, indicate that inevitable defects in manufactured nanotubes will lead to significant strength reductions. Laboratory tests have shown that flawless individual nanotubes can withstand about 100 gigapascals of tension, but he points out that if just one carbon atom is missing in a nanotube, it can reduce its strength by as much as 30 percent. Ribbon tethers made of many nanotubes, in effect increasing the number and seriousness of defects, are bound to be even weaker, averaging less than 1 gigapascal in tensile strength, according to Pugno. However, space elevator enthusiasts have pointed out that in his calculations he did not include the friction forces between long, closely packed nanotubes. These could make up for defects in individual nanotubes, creating an overall sufficiently strong ribbon. Moreover, nanotubes with buckyball hemisphere structures attached on their sides increase this friction, and can already be produced. Such molecular appendages make it possible to hook nanotubes to each other or to the composite matrix, so that loads can be transferred between individual nanotubes more efficiently. This should result in a ribbon that is much stronger than one that incorporates only smooth nanotube molecules. Thus, the jury is still out on whether the space elevator based on carbon nanotube ribbons will ever be feasible. It is impossible to predict when the continuous improvements in nanotube ribbon development will run out of steam, and whether that would be well before or after space elevatorenabling ribbons can be produced. Many space elevator enthusiasts are optimistic and foresee a fully operational space elevator rising into space within 30 years or so. Others think that the ribbon material requirements cannot be fulfilled, at least not with carbon nanotube fibers, and that the space elevator will remain a dream for the rest of this century.